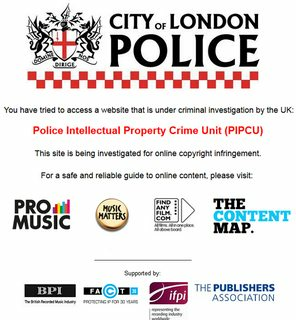 We've highlighted a number of stories recently about the City of London Police, who have partnered with a few legacy players from the entertainment industry, and are using a bunch of taxpayer money to try to shut down websites the copyright industry doesn't like -- based on no clear legal reasoning or authority. They often seem to just rely on their name and bogus threats to get registrars to kill sites -- a process that has been found to violate ICANN policies for registrars. However, most registrars just give in, because the City of London Police just look so damn official. Over the weekend TorrentFreak noted that a few more sites have been shuttered based on no court order, no judicial findings, but just the City of London Police's say so. This includes FileCrop, a site that hosted no infringing files at all, but which is just a search engine. Once again, the police make no effort whatsoever to hide the fact that they're doing the bidding of the legacy entertainment industry -- directly linking to their favored sites and flat out saying that they're supported by BPI, IFPI, FACT and the Publishers Association. Whether or not the sites that are being taken down are, in fact, violating the law, everything about this process is highly questionable. Taking down websites without a court order is a blatant attack on free speech. And, yes, while the UK does not have the same free speech traditions as the US, it does still hold itself out as being a believer in free speech. It is difficult to see the shuttering of a website without any due process as little more than blatant censorship. Perhaps even more troubling is the fact that this censorship is proudly done to support legacy industries who see the internet as something to be shunned and attacked. How would people respond if the City of London Police suddenly, with no court order, shut down BSkyB and proudly announced it was doing so with the support of the BBC? Or shut down AirBnB and announced it was doing so with the support of the British Hospitality industry? Or shut down EasyJet and did so with the support of British Air? Wouldn't people be outraged? Yeah, you can just have your property removed until you go to court at your own expense. that's justice, alright. That's astounding stupid, even for you. God, you're a moron Paul. What happens when you get stopped by a traffic cop and he finds a large bag of money in the back seat? You know it gets confiscated. And how do you get it back? You go to court at your own expense. The law is different on the internet. Sorry.